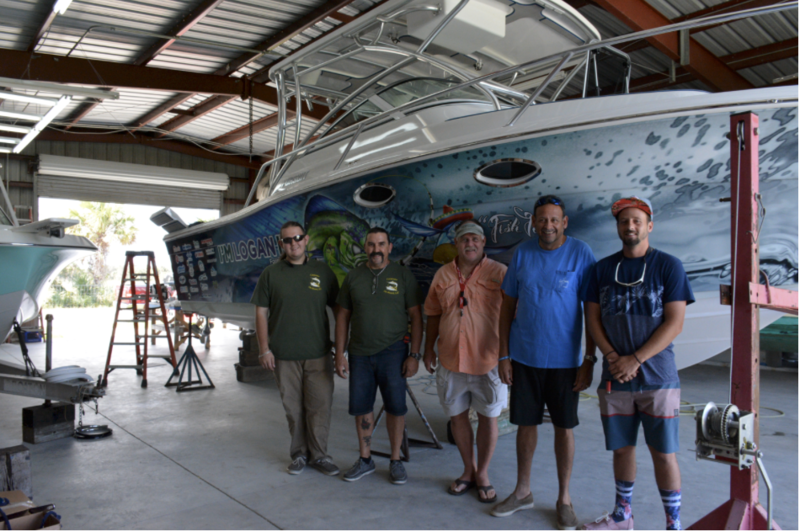 For the first time since buying his winning ticket P5672 on Nov. 4 during the Fort Lauderdale International Boat Show, the TACO Marine Project Boat winner Roger LeFranc visited his soon-to-be boat! 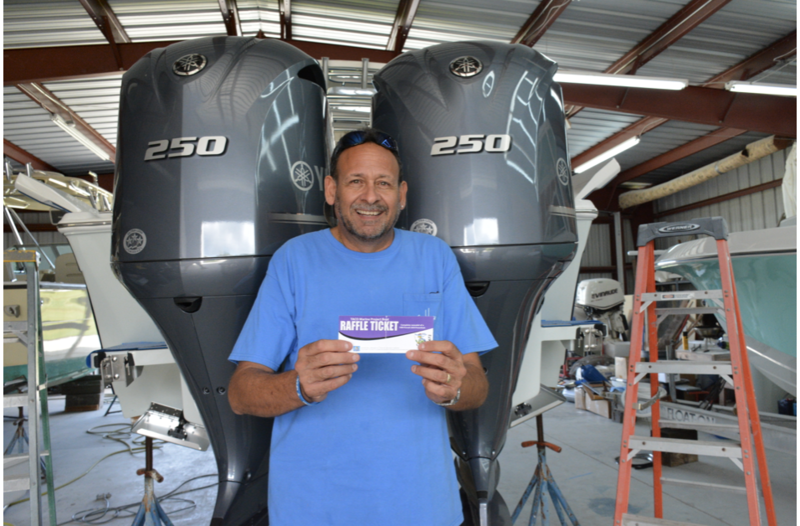 Holding his winning ticket P5672, TACO Marine Project Boat winner Roger LeFranc stopped by the Ship Shape TV workshop Nov. 30 to tour his new boat. Behind LeFranc are brand new Yamaha F250 twin outboard engines. LeFranc, of Melbourne, Fla. visited the Ship Shape TV workshop in Indiantown, Fla., accompanied by his son Justin, brother-in-law Hank Berry of Okeechobee, Fla., nephew Dylan Berry of Okeechobee, Fla. and friend Tim Neuman of Satellite Beach, Fla.
TACO Marine Project Boat winner Roger LeFranc, standing second from the right, brought members of his family and close friend to tour his new boat. Left to right: Nephew Dylan Berry, brother-in-law Hank Berry, friend Tim Neuman, LeFranc and son Justin. In the coming weeks, the professionals from Ship Shape TV will be applying the finishing touches to the TACO Marine Project Boat, such as painting inside the bilge and hatches and conducting on-the-water tests. Pretty soon, LeFranc will be cruising into the Florida sunset aboard his new boat, which he plans to name “Justin Time,” after his son. 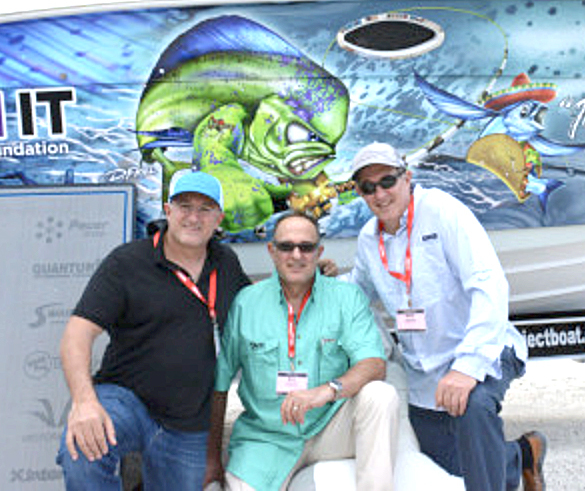 Announcing Winner of the TACO Marine® Project Boat! We are excited to announce the winner of the TACO Marine® Project Boat Raffle Fundraiser is Roger LeFranc from Melbourne, Florida! LeFranc was randomly selected Nov. 5 at 1 p.m. EST during the final day of the Fort Lauderdale International Boat Show. After a two-and-a-half year remodeling venture extensively chronicled on Ship Shape TV and a successful fundraising campaign with nearly 1,800 entrants and donations, the TACO Marine Project Boat Raffle Fundraiser raised more than $130,000 for the I’M LOGAN IT Foundation! All proceeds from the Raffle Fundraiser support the Juvenile Diabetes Research Foundation and college scholarships for deserving students. Donations for a chance to win Project Boat poured in from around the country – including states as far away as Hawaii, Alaska, and Maine! Thank you for all your generous donations and support! 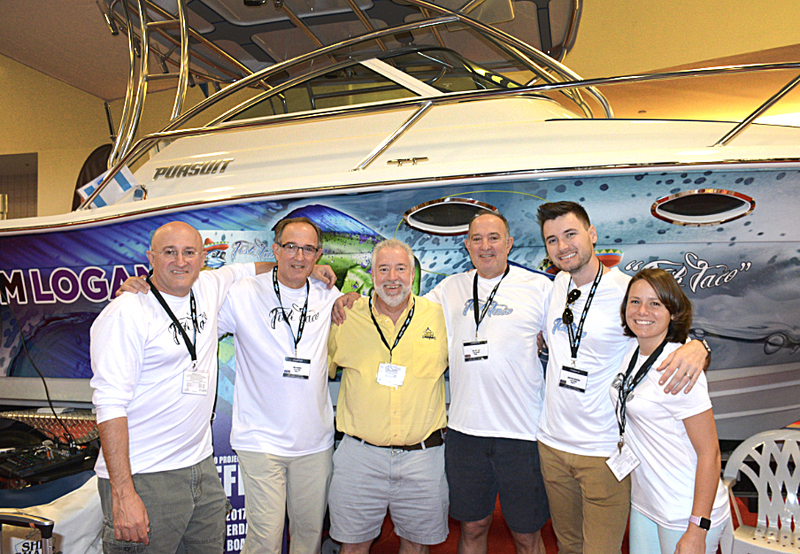 The TACO Marine Project Boat would not have been possible without the tremendous support from its many amazing sponsors and organizers, including John Greviskis and the entire team at Ship Shape TV. Since 2015, the TACO Marine Project Boat was featured on 29 Ship Shape TV episodes. You can find all these episodes and more at tacomarineprojectboat.com. We’d also like to send a special thank you to the Informa organizers at the Fort Lauderdale International Boat Show for their support of the TACO Marine Project Boat and the I’M LOGAN IT Foundation – helping promote and organize the raffle fundraiser for charity. From all of us at TACO Marine, thank you to all of the sponsors and boat show organizers who helped make the TACO Marine Project Boat Raffle Fundraiser a success. The TACO Marine Project Boat represents a full transformation of a tired 28-year-old boat into a brand new, custom beauty – showcasing the latest and greatest products from TACO and dozens of other leading marine product manufacturers. Yet this industry-wide collaboration represents so much more than just a great remodeling venture – it also represents hope, caring for others, giving back and continuing the legacy of an amazing young man. Project Boat began more than two years ago as a bold idea to raise money for charity – specifically, the I’M LOGAN IT Foundation, which provides support to the Juvenile Diabetes Research Foundation and scholarships to deserving students. Logan volunteered for the JDRF – parking cars in a full tuxedo. I’M LOGAN IT was created in memory of Logan Matthew Kushner, who passed away in 2012. 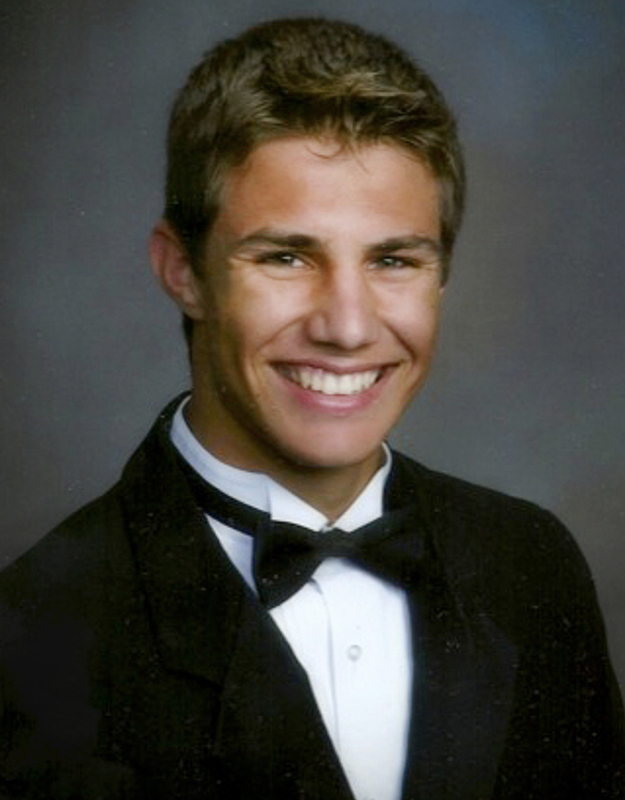 Logan left behind a legacy dedicated to education, team sports and helping others. Logan never knew a stranger. His most important qualities were caring about people and positively impacting the lives of others. His smiles, hugs and enthusiasm for life were genuine. Logan is dearly missed. As a 59-year-old business founded on family principles, TACO has always strived to develop more than just business agreements with our customers, but rather long-standing relationships and friendships – values Logan emulated throughout his life. All proceeds from every Project Boat raffle ticket donation are given to the I’M LOGAN IT Foundation – helping kids in need and striving to make a positive impact in the lives of others. The Foundation’s goal is to remind us to always give 150 percent effort in everything we do and to always be there to lend a hand to those in need – just like Logan did. Please lend your support by making a donation for a chance to win this unique custom boat and by sharing Project Boat with all others you know who may be interested. For additional information please visit go.rallyup.com/projectboat. The TACO Marine Project Boat at the Tampa Boat Show. Thank You for Visiting! The Tampa Bay Buccaneers cheerleaders and Captain Fear stopped by the TACO Marine Project Boat Saturday, Oct. 14, 2017, at the Tampa Boat Show. All of us at TACO Marine, thank you for your support of the TACO Marine Project Boat Raffle Fundraiser – especially during the Tampa Boat Show! If you attended the show, you got to see and explore this special Project Boat in-person! All of the raffle ticket proceeds are given to the I’M LOGAN IT Foundation, which provides support to the Juvenile Diabetes Research Foundation and college scholarships to deserving students. 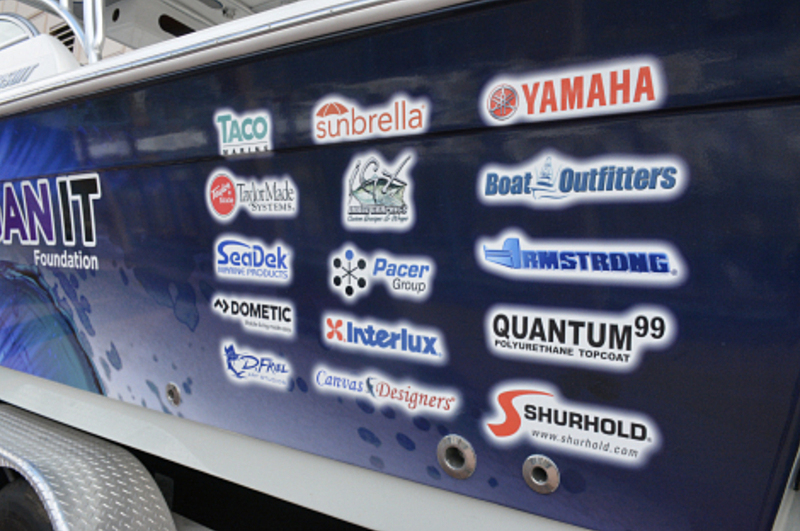 The TACO Marine Project Boat is sponsored by many marine leaders, including Yamaha Marine, SeaDek and many more! Thanks to the generous support of the marine industry for their contributions and helping to make the TACO Marine Project Boat state-of-the-art. The TACO Marine Project Boat raffle drawing is slated for Nov. 5 at the Fort Lauderdale International Boat Show. You can purchase tickets online at go.rallyup.com/projectboat and in-person at the Fort Lauderdale International Boat Show Nov. 1-5 at booth #2000-A. We hope to see you there, and maybe you might even have the winning raffle ticket for this very special boat! I’M LOGAN IT was created in memory of Logan Matthew Kushner, who passed away in 2012. The Foundation aims to help young people establish healthier self-esteem through acts of kindness and mentorship – values by which Logan lived. Discover more about the TACO Marine Project Boat right here on this 29-part blog. Please visit the I’M LOGAN IT Foundation here. Beyond the Boat: TACO Marine Gives to Charity, Helping Those in Need. I’M LOGAN IT was created in memory of Logan Matthew Kushner, who passed away in 2012. Logan’s most important qualities were caring about people and positively impacting the lives of others. The TACO Marine Project Boat began more than two years ago as a bold idea to raise money for charity – specifically, the I’M LOGAN IT Foundation, which provides support to the Juvenile Diabetes Research Foundation [JDRF] and scholarships to deserving students. I’M LOGAN IT was created in memory of Logan Matthew Kushner, who passed away in 2012. Logan left a legacy dedicated to education, team sports and helping others. Logan never knew a stranger. His most important qualities were caring about people and positively impacting the lives of others. His smiles, hugs, and enthusiasm for life were genuine. Logan also enjoyed being involved in the JDRF, where he parked cars in a full tuxedo during an annual gala to support a close family friend. The Foundation’s goal is to remind us to always give 150 percent effort in everything we do and to always be there to lend a hand to those in need. Since launching Project Boat, Ship Shape TV documented on their show the boat’s transformation, and TACO Marine turned it into a 29-part Blog series. Viewers can experience everything from stripping the boat bare to installing the helm, seating, hard top and so much more. What makes Project Boat unique is the fact that it’s a fully remodeled, one-of-a-kind, completely customized Pursuit 2650 with the latest, most-advanced products on the market today. This is a once-in-a-lifetime boat you won’t find anywhere else, and 100 percent of the proceeds are given to charity. Get your raffle fundraiser tickets today at go.rallyup.com/projectboat. The TACO Marine Project Boat raffle drawing is slated for Nov. 5 at 1 p.m. EST during the Fort Lauderdale International Boat Show. Entrants do not need to be present to win. 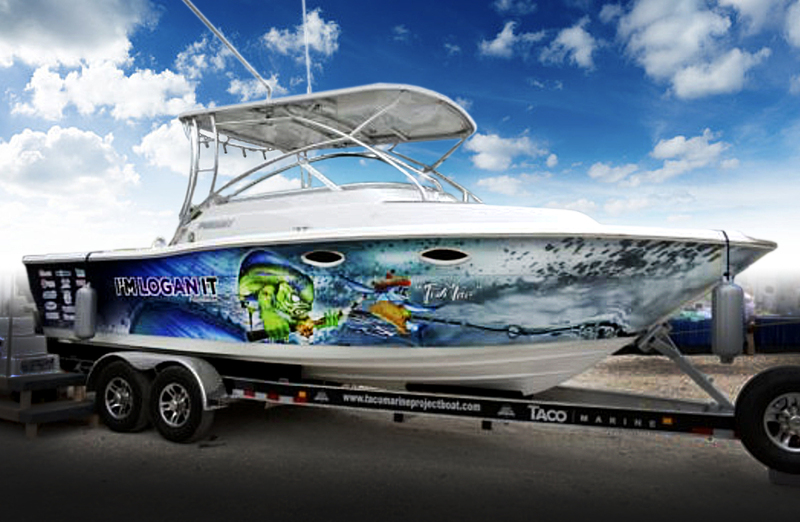 Custom “Fish Taco” boat wrap design by Dennis Friel Art Studios. More than 40 marine industry leaders rallied together to support the TACO Marine Project Boat, which has the latest, most-advanced features on the market today. Project Boat is worth more than $150,000 and all raffle ticket proceeds are given to charity! We invite you to check out the TACO Marine Project Boat in-person at the Tampa Boat Show Oct. 13-15 and the Fort Lauderdale International Boat Show Nov. 1-5. The drawing is happening live from the Ft. Lauderdale International Boat Show Nov. 5 at 1 p.m. EST. Entrants do not need to be present to win. You can buy tickets at both boat shows or online right now at go.rallyup.com/projectboat. Help us spread the word about this amazing fundraiser for the I’M LOGAN IT Foundation. Please share information about the TACO Marine Project Boat Raffle Fundraiser for charity with your friends and family. For more information about TACO Marine Project Boat, please visit tacomarineprojectboat.com, imloganit.com and go.rallyup.com/projectboat. 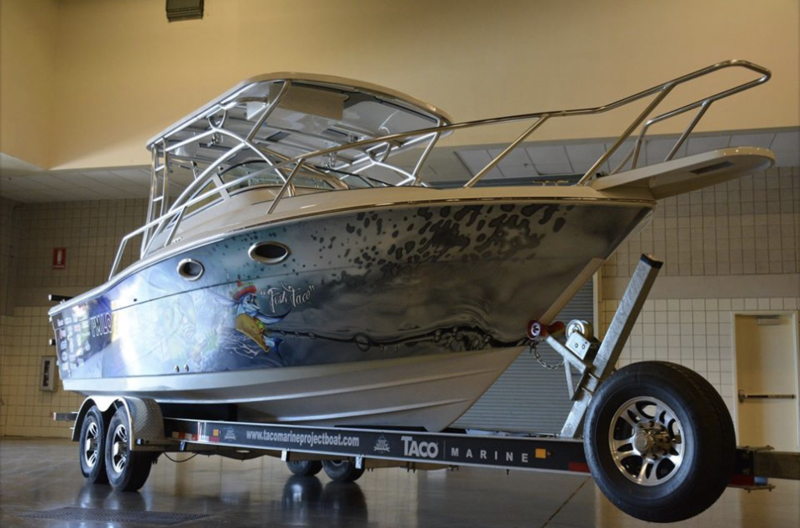 Buy Tickets Now for the TACO Marine Project Boat Raffle!